WHY ARE PEOPLE SO FASCINATED BY MONKEYS, COULD IT BE BECAUSE WE ARE SO CLOSELY RELATED AND WE JUST CANT RESIST THE CURIOSITY TO KNOW MORE ABOUT THEM. THESE DAYS EVERYWHERE YOU LOOK, ESPECIALLY WITH KIDS APPAREL YOU WILL FOR SURE SEE A SMILEY MONKEY FACE ON A LOT OF PRODUCTS AND THAT DOES SAY SOMETHING ABOUT HOW MUCH WE LOVE THEM AND NOT TO MENTION PROBABLY 90% OF PEOPLE ON THE PLANET EAT BANANAS EVERYDAY,THE MONKEY’S MOST FAVORITE FOOD. THERE’S A LOT OF DIFFERENT SPECIES IN THE WORLD EVEN SOME NEW ONES STILL GETTING DISCOVERED TO DATE.ORIGINALLY FROM EAST AND SOUTHERN AFRICA THE VERVET MONKEY IS ONE VERY INTELLIGENT PRIMATE AND EASILY ADAPT TO MODERN SOCIETY.IF YOU HAPPEN TO TRAVEL TO CITIES IN AFRICA THAT ARE CLOSE TO NATIONAL PARKS OR LODGES THAT HAVE VERVET MONKEYS ROAMING AROUND,YOU MIGHT WANT TO PAY ATTENTION TO YOUR BELONGINGS BECAUSE THEY COULD EASILY GET INTO YOUR HANDBAGS OR SNEAK INTO YOUR ROOM THROUGH UNLOCKED WINDOWS AND STEAL YOUR STUFF.THEIR INTENTION IS OBVIOUSLY TO STEAL SOME READILY AVAILABLE FOOD,BUT MISTAKEN IDENTITY OR JUST IN PURE RUSH WHEN THEY GET CAUGHT COULD HAVE YOUR VALUABLE STUFF STOLEN.TO AVOID SUCH A SCENARIO FROM HAPPENING,ALWAYS MAKE SURE YOU DON’T LEAVE WINDOWS OPEN EVEN IN CARS WHEN YOU AREN’T THERE OR JUST KEEP YOUR BELONGINGS SAFE AND SOUND BUT OTHERWISE THEY,RE REALLY SOCIAL AND HARMLESS HAPPY CREATURES. 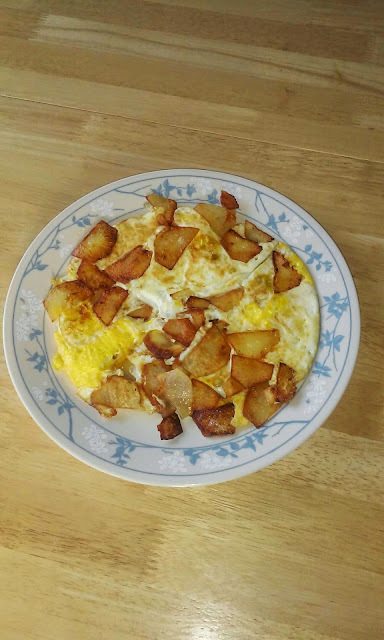 There's times where cereal or bread for breakfast don't seem to make the cut and at those moments where you can't seem to think of something fast and easy to make,here is a quick breakfast recipe that more than likely will make you happy and ready for the day as you know breakfast is the most important meal of the day. -1/4 cut from a stick of butter or just enough to make the potato not stick on the pan. -A pinch of salt and pepper if you prefer. 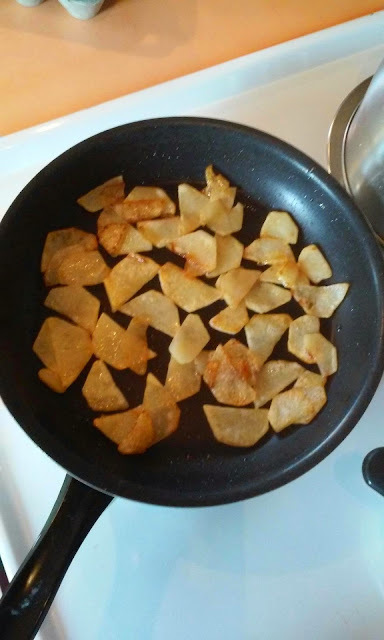 Peel the potato and cut along in half and thinly dice each potato half then take the diced potatoes and spread them in a hot flat pan with butter. For the diced potatoes to come out nicely browned try to make sure they aren't on top of each other and as each side is nicely browned and mildly crispy,break the eggs and spread them evenly on the pan or if you don't like hard fried eggs you could scramble them with the potatoes and take them out as soon as desired and if you don't mind hard cooked eggs just let it cook till you can feel it intact and gently flip and do the same on the other side and maybe am talking kitchen language but what i mean by feeling the pan is when you're holding your pan and gently rotating it on the stove you can feel the movement of eggs and potatoes in the pan,if you can't feel the movement then it's not ready to flip. 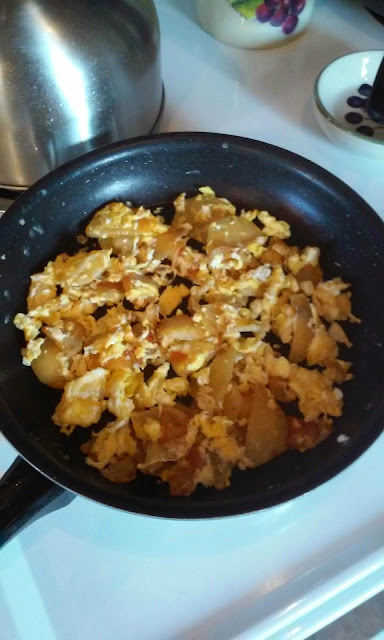 If u prefer salt and pepper try adding a pinch of it as soon as you crack the eggs just because if you prefer to scramble then you will get it a little more evenly spread but its up to you. You could serve your breakfast as is or if you're a meat lover,ham or bacon would go great with it. For anyone that works hard you know you need not only a great breakfast but one that packs a punch of protein to get your day going much smoothly than a piece of toast or bowl of cereal would. 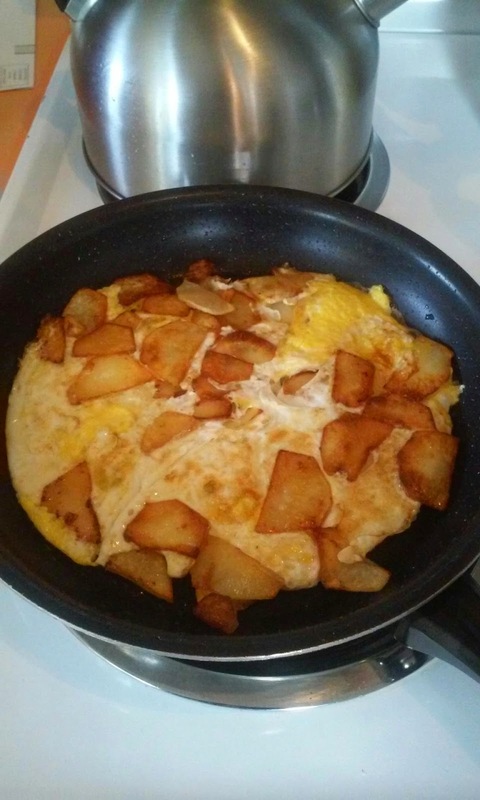 The pictures below shows both hard fried and scrambled eggs with diced potatoes.